Farmer Brown, Food Hero – Food. Boom. I love a good food festival. Food, festivities, what’s not to love? And my home town certainly isn’t short of a culinary celebration in the summer months. Or any other kind of celebration being held in lower castle park with a bit of room for some grub stands. I wont lie to you, they aren’t always stuff to write home about. Just last weekend there was some kind of, well, I think it was about the Philippines. Or Filipinos, but the route of the cause was lost in a sparse and non specific scattering of little gazebos either flogging insurance, flights to Manilla or some kind of non specific meat BBQ dish. All in all something of a non starter. But in contrast there was this year’s Co-Op sponsored food fayre which yielded some marvellous finds including previously penned about Tess’s Cakes and my first taste of Kangaroo. There was also an oppressive amount of people and some very bad sangria, but let us not dwell on these minor asides. I’d have to say I would have missed Farmer Brown and his omega 3 and 6 rich wares as they were in the Co-Op tent which to me appeared to be a startlingly cynical marketing opportunity for the bloody co-operative food people who’s logo was already banded across something highly visible approximately every 20 yards. I’m not against them or anything, but I wouldn’t have bothered going inside as there was new and live foodie action everywhere else. However, two out of three companions were Co-op employees, eager to, well, go in and have a look, so we did. 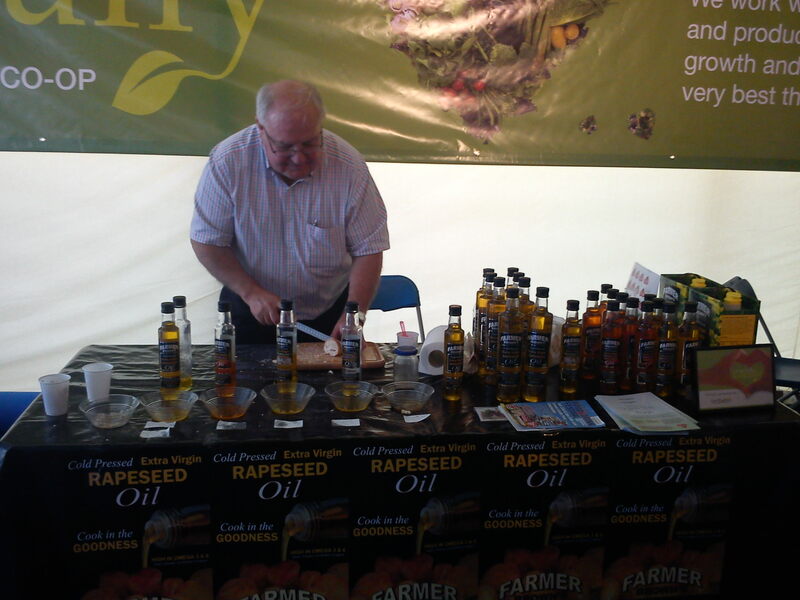 And here we had an unenthusiastic and kind of grumpy man doing his best to get people to buy rapeseed oil. Hmm. Poor salesmanship really isn’t enough to put me off of a free food sample- a wee bit of cracker and a free dip. 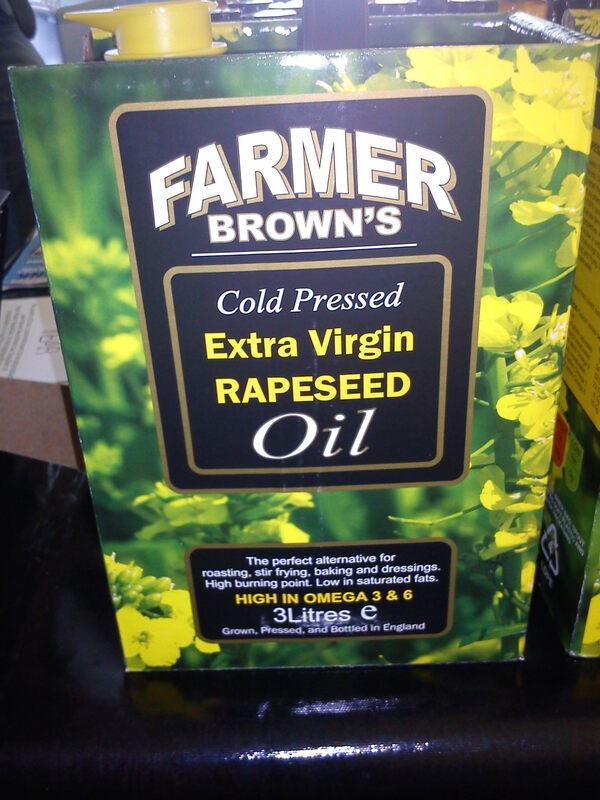 Here’s the dietary science bit quickly- rapeseed oil (or canola if you’re on the wrong side of the Atlantic) is plugged as being heart healthy as it’s the lowest saturated fat cooking oil going and trans fat free. It’s a good source of vitamin E and omega oils for people who aren’t big on oily fish, it’s lighter in taste than olive oil and it has a high flash point, making it good for a really crispy frying result. All interesting stuff but nothing ground breaking here or even particularly tempting. Except that Farmer Brown’s do a smoked variation. Ooooh. Smoked stuff is becoming increasingly tempting these days and I have to say I’m a fan. 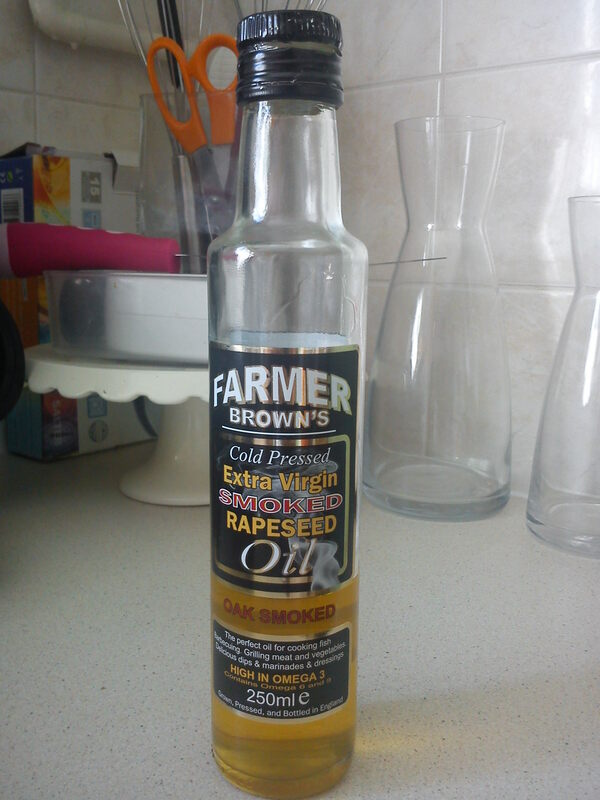 And the FB smoked oil is yummy, and despite the best efforts of Mr Grump I was happy to part with my cash for a bottle. It was about a fiver I think. A couple of months on, and I’m sold on this wonderful stuff and elevating it to food hero status not just because of the aforementioned debatable health benefits but because it’s yummy, and it makes making smokey tasting stuff easy. You see, what with being so trendy, smoked stuff isn’t necessarily cheap to buy and you’ll never know until you get home if it’s any good. Asda smoked mackerel pate is a great example- it’s minging. The majority of supermarket smoked cheeses are plastic and unpleasant too, and if you don’t have an enormous garden and a lot of spare time it’s not so practical to smoke-your-own at home. This stuff takes away all the effort and fore-planning. Its light but definite smoky finish means you don’t need a lot to add some depth to whatever you’re cooking, and I do mean whatever. It’s great for your fry up mushrooms, adds a really lovely kick to a pasta sauce and a tiny drizzle to dips or salad dressings gives a tasty but subtle difference. I’m not going to roast my potatoes in it, but you can’t beat it for thrifty treat value. And you can buy it in your local co-op food store! For considerably less than I paid at that bloody stall, but I’ll know for next time. NextAre you going to eat……Eggs?